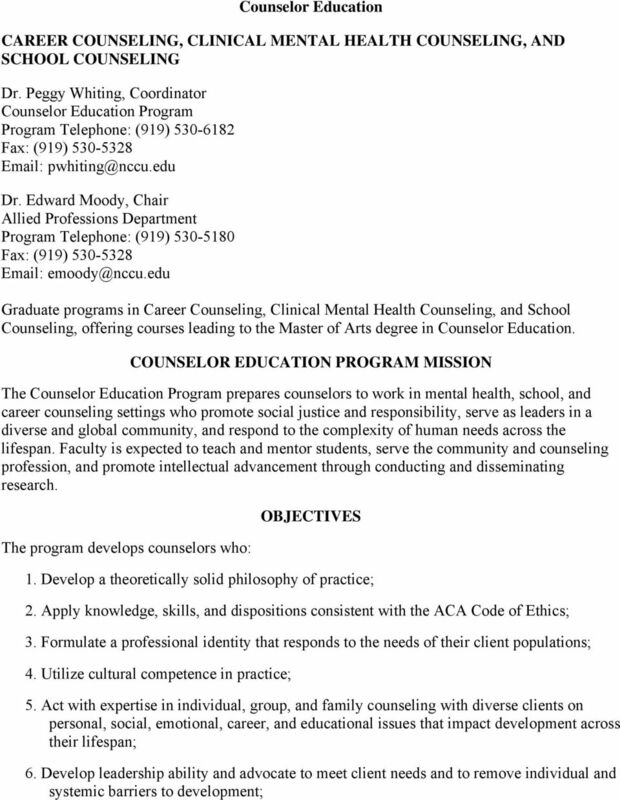 Download "Counselor Education CAREER COUNSELING, CLINICAL MENTAL HEALTH COUNSELING, AND SCHOOL COUNSELING"
6 This course is designed to provide an overview of substance abuse counseling and psychopharmacology for mental health counselors. Topics discussed include addiction issues, diagnosis, treatment planning and individual and group counseling strategies with diverse populations. Additionally, students will be exposed to the fundamentals of psychotropic medications. Basics of pharmacology, adverse effects, indications, and drug interactions will be discussed. Boundaries of practice and practical issues of assessment and referral will be covered. 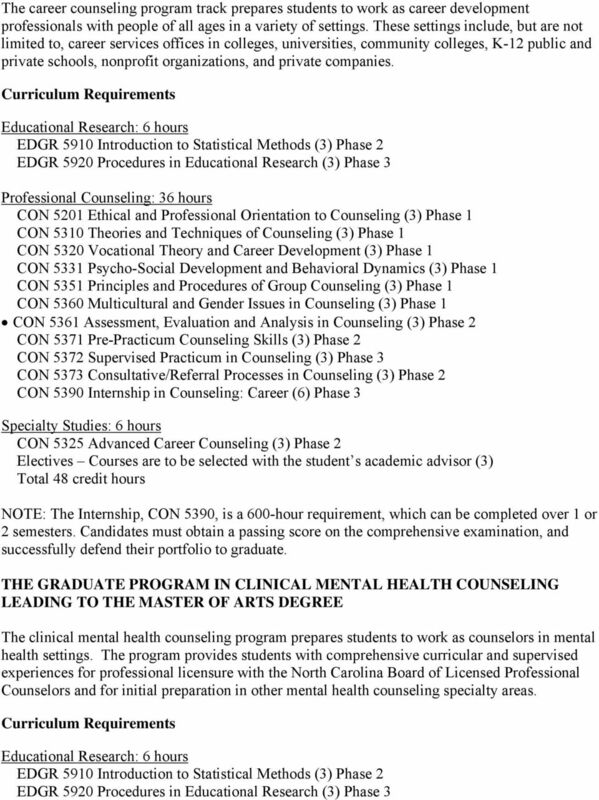 CON 5307 Crisis, Trauma, and Grief Counseling (3) This course will provide specialized instruction for candidates in the Clinical Mental Health Counseling concentration of the Counselor Education Program. Candidates will learn advocacy, consultation, crisis intervention and clinical strategies for assisting clients facing life changes, transitions across the lifespan, and loss and traumatic events. CON Theories and Techniques of Counseling (3) This course provides a comprehensive study of the major approaches to counseling and psychotherapy, the philosophy, theorists, techniques, and research associated with them. Students will develop an initial philosophy of practice and will identify preferred treatment procedures for selected client problems. 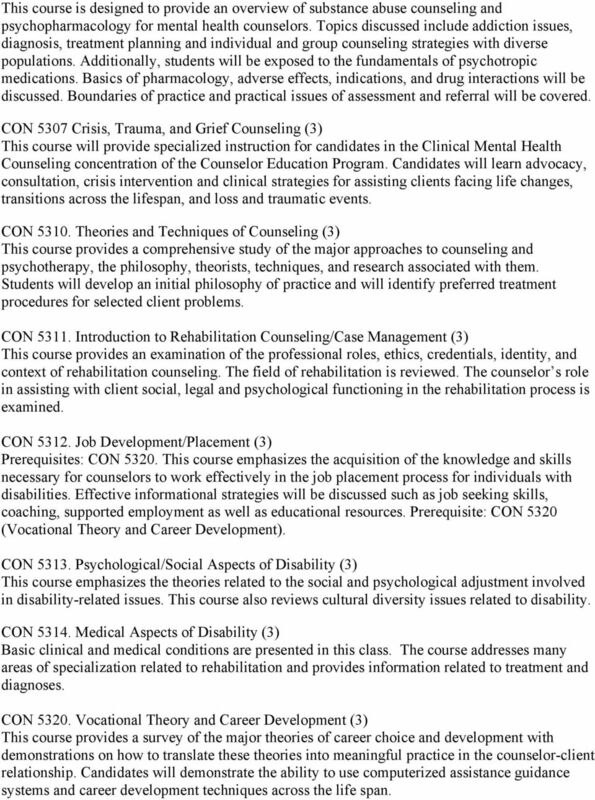 CON Introduction to Rehabilitation Counseling/Case Management (3) This course provides an examination of the professional roles, ethics, credentials, identity, and context of rehabilitation counseling. The field of rehabilitation is reviewed. The counselor s role in assisting with client social, legal and psychological functioning in the rehabilitation process is examined. CON Job Development/Placement (3) Prerequisites: CON This course emphasizes the acquisition of the knowledge and skills necessary for counselors to work effectively in the job placement process for individuals with disabilities. Effective informational strategies will be discussed such as job seeking skills, coaching, supported employment as well as educational resources. Prerequisite: CON 5320 (Vocational Theory and Career Development). CON Psychological/Social Aspects of Disability (3) This course emphasizes the theories related to the social and psychological adjustment involved in disability-related issues. This course also reviews cultural diversity issues related to disability. CON Medical Aspects of Disability (3) Basic clinical and medical conditions are presented in this class. The course addresses many areas of specialization related to rehabilitation and provides information related to treatment and diagnoses. CON Vocational Theory and Career Development (3) This course provides a survey of the major theories of career choice and development with demonstrations on how to translate these theories into meaningful practice in the counselor-client relationship. Candidates will demonstrate the ability to use computerized assistance guidance systems and career development techniques across the life span. 8 practicing skills in classes. 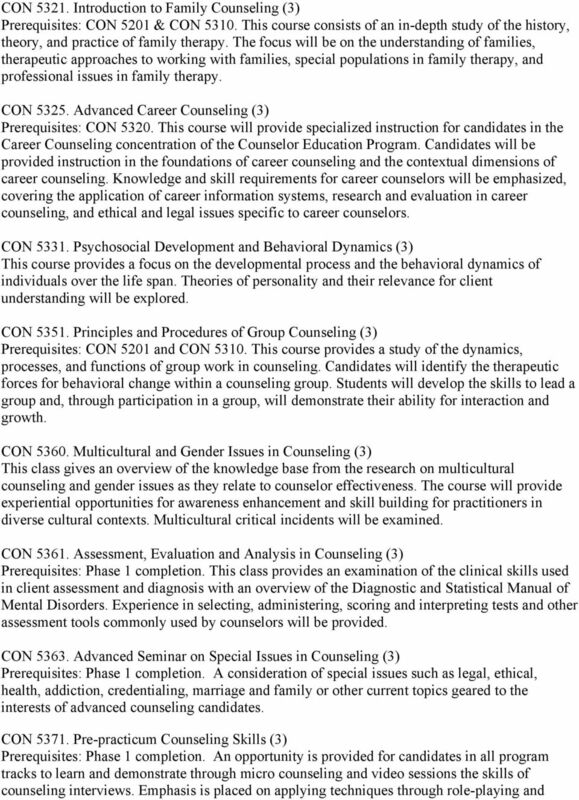 This is a practice oriented course with major emphasis on applying counseling techniques, considering multicultural issues and analyzing counseling style and performance through a reflection and self-evaluation process. 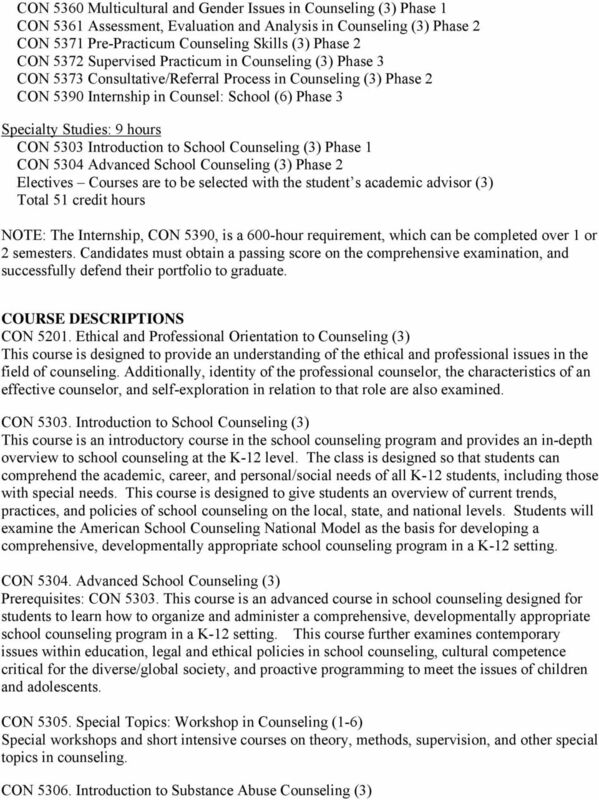 Candidates must achieve a grade of B or better in this course before placement in CON 5372 and or CON CON Supervised Practicum in Counseling (3) Prerequisites: Phase 2 completion and a B or better in CON Advanced candidates in counseling will participate in a clinical instructional environment under the supervision of a faculty member. Candidates will receive supervision from a faculty member as they obtain individual and group counseling experience. The practicum is a 100-hour field experience in a mental health, career, or school counseling setting. 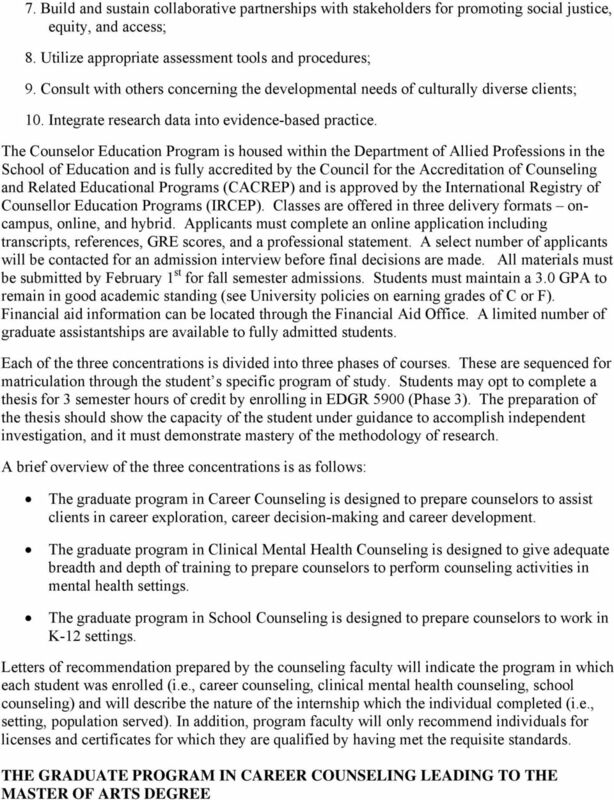 CON Consultative/ Referral Processes in Counseling (3) Prerequisites: Phase 1 completion. This course provides an examination of the theories of consultation and the skills needed in working with parents, families, agencies, and organizations. Opportunities to practice consultation in class and the field will be provided. The development of treatment plans will be discussed as well as procedures and processes for making referrals. 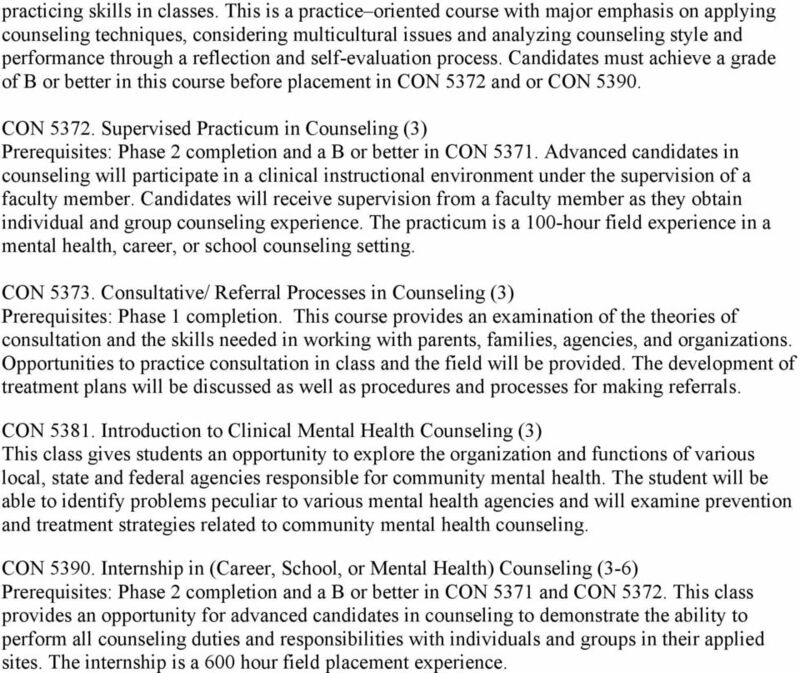 CON Introduction to Clinical Mental Health Counseling (3) This class gives students an opportunity to explore the organization and functions of various local, state and federal agencies responsible for community mental health. The student will be able to identify problems peculiar to various mental health agencies and will examine prevention and treatment strategies related to community mental health counseling. 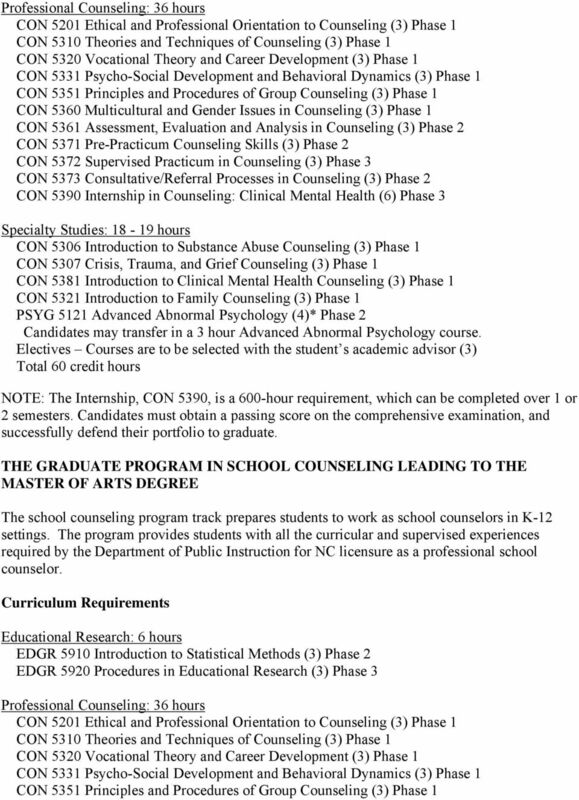 CON Internship in (Career, School, or Mental Health) Counseling (3-6) Prerequisites: Phase 2 completion and a B or better in CON 5371 and CON This class provides an opportunity for advanced candidates in counseling to demonstrate the ability to perform all counseling duties and responsibilities with individuals and groups in their applied sites. The internship is a 600 hour field placement experience. 2. Program faculty will endeavor to include the most current evidence-based and/or outcome-based research in their course work. Legal and Ethical: Application of current legal and ethical standards and guidelines to diverse clinical populations and community systems.